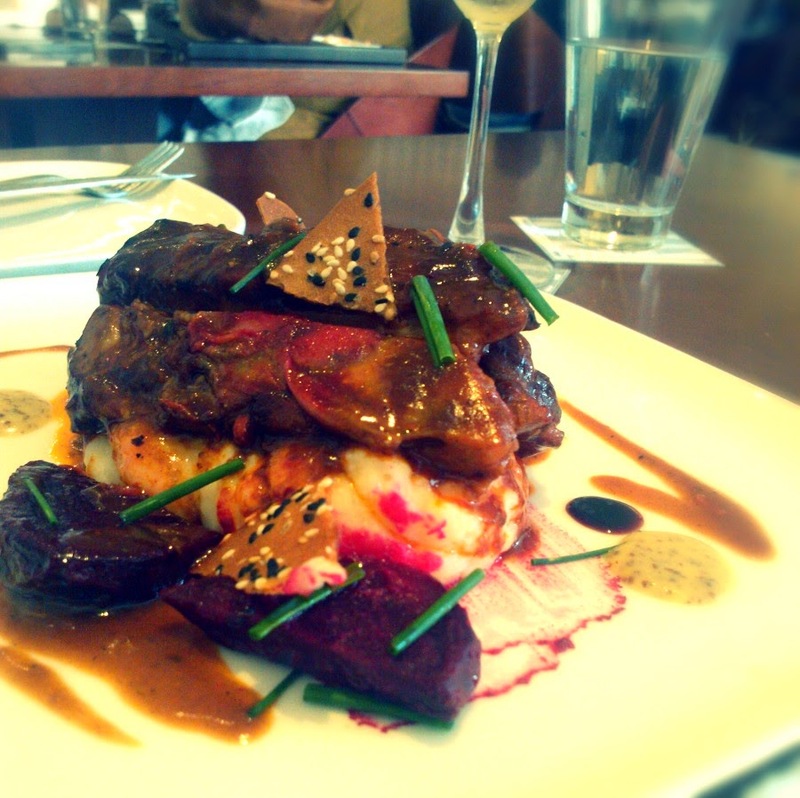 Caramel Wings: Food Review: Smoke House Deli, Bandra Kurla Complex. 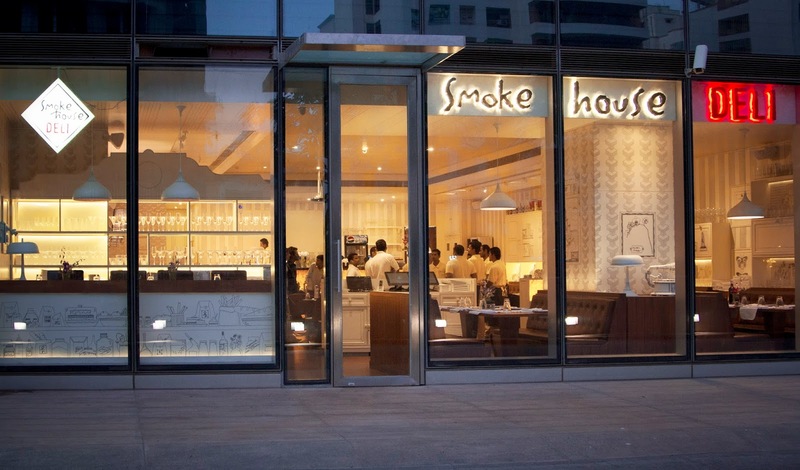 Food Review: Smoke House Deli, Bandra Kurla Complex. Pharrell William's Happy is doing the rounds almost everywhere on the internet. Its great, everyone is uploading their version of the Happy Song on youtube, so much so that someone has actually uploaded a parody video called 'Crappy'. Crappy makes them Happy. Well, whatever floats their boat! Happiness for me is simple things. Food, Love, and Laughter. Smoke House Deli has consistently managed to maintain the number 1 spot in all 3 departments for me. It also happens to be my most visited place for a Date night, other than Big Chill in New Delhi, just for the perfect setting and feel-good ambiance along with lip smacking food. Smoke House Deli has opened their brand new outlet at Bandra Kurla Complex, which happens to cater to mostly clientele who want to grab a quick lunch during their break from office, or who want to chill with a drink after work. Time is the essence to this outlet, in my opinion. I visited on a Sunday afternoon, and it was very difficult for me to even get a reservation for a Sunday as the restaurant was absolutely jam packed. Through my 2 hour review, they must have done at least 30 covers, and each table left with a smile on their faces, which is a pretty good sign already. I must mention the ever smiling faces of the entire crew (front of the house as well as kitchen crew) at Smoke House Deli that are always ready to help you out, and I tried out most of the dishes solely on the suggestion of my server for the day. One important attention to detail from him was that he asked me what I preferred (spicy/non spicy, kind of meat) for the first course and appropriately suggested everything else. Kudos to every single wait staff at the restaurant! Okay, now lets get down to Food! We started with the Melon Sangria. Sangria is definitely one of the USP's of Smoke House Deli. 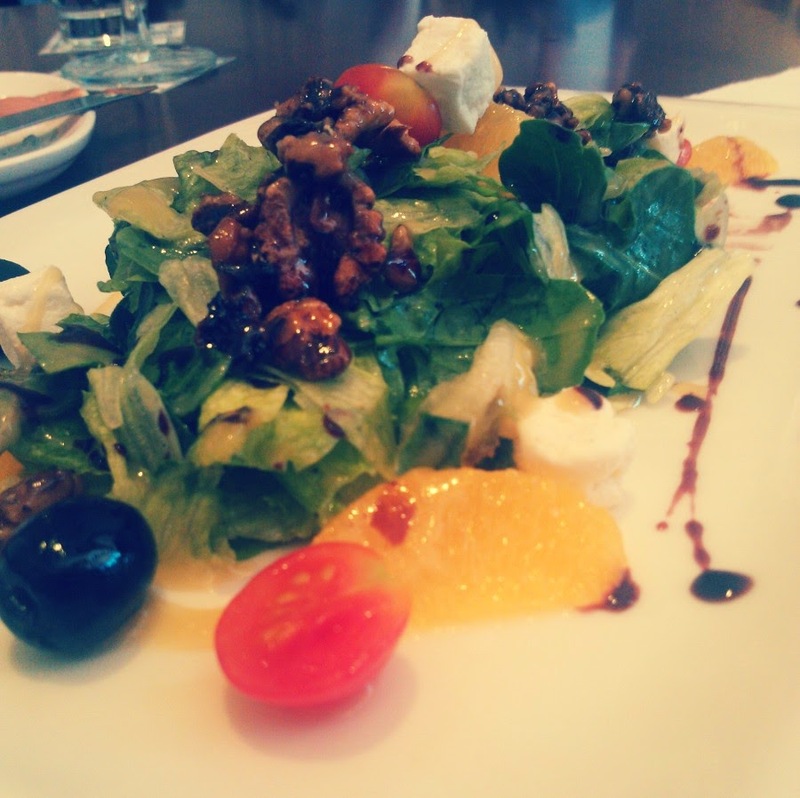 Its a must try item from their menu! Please check with the server for offers, as they do have offers for unlimited Sangria! 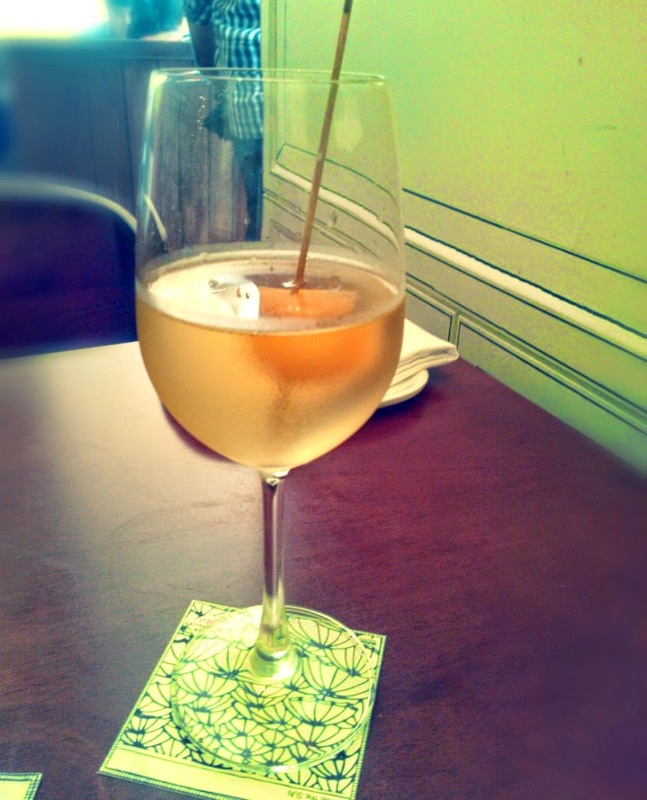 For all the teetotalers, Smoke House Deli offers a great variety of mocktails. 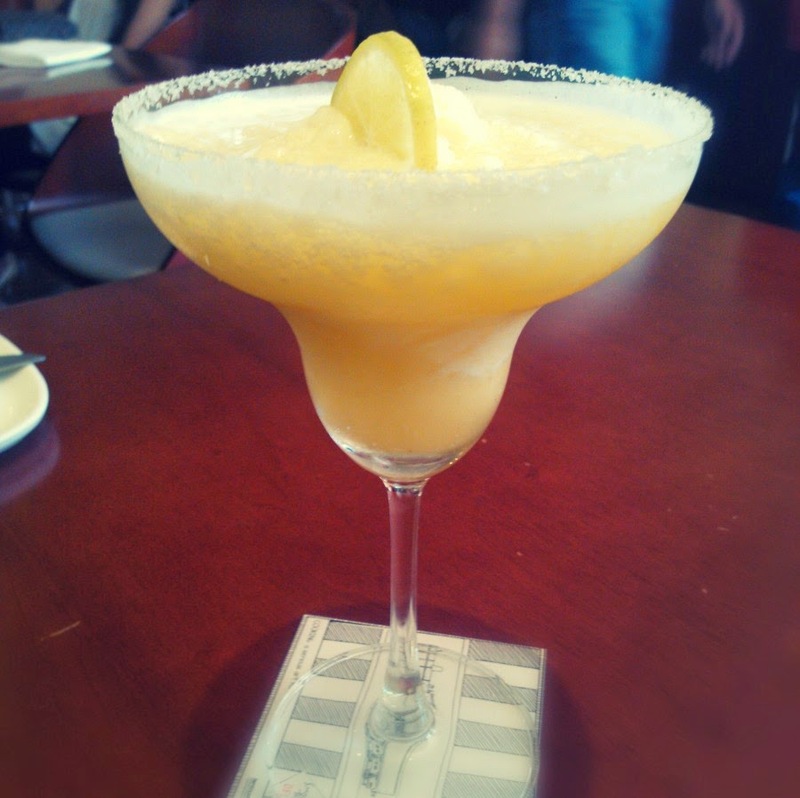 We called for the Pineapple Margarita which was not bad at all. Seafood Fritters consisting of Calamari, Basa, and Tiger Prawns fried to crisp perfection was a great appetizer and is highly recommended if you are having any booze on your table! Chicken Liver Pate on Crostini with Green Apples and Balsamic Reduction. 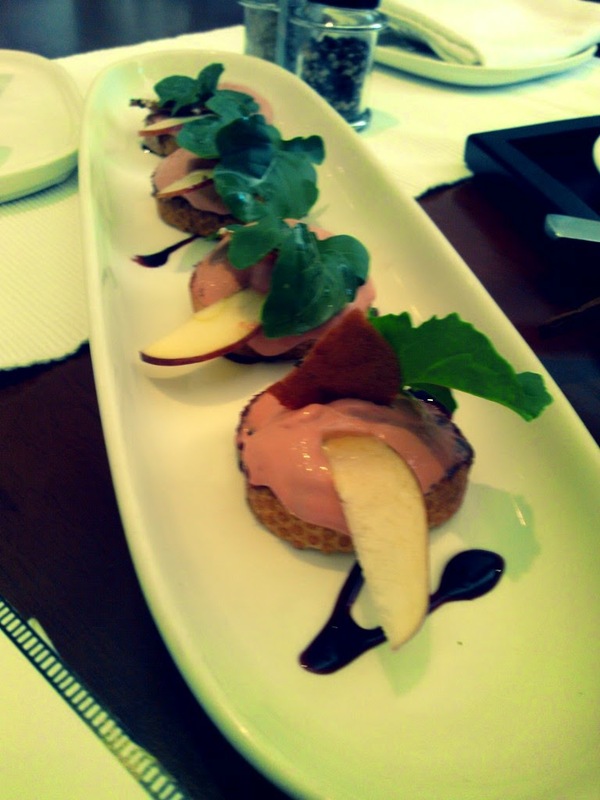 The Chicken Liver Pate on Crostini was served with Green Apples as garnish and a Balsamic reduction had too much Pate on it in my opinion. It tasted great, but maybe it could do with a little less Pate on there. Then again, it is just my opinion! I have made it a rule to add the salad course to my meals everyday. This, coming from the girl who thought eating Salad was just a waste of stomach space is a huge thing. The Oak Ash Chevre Salad with Californian Oranges and Passion Fruit emulsion is the perfect example of scaling the line between health and taste. Loaded with just the perfect amount of Feta and the offset balance provided with the character of Olives and tartness of the Cherry Tomatoes, it is pure symphony in your mouth. I would highly recommend both - adding Salads to your meals, and this heavenly plate of awesomeness too! Cambodian Basa with Smoked Pimento Puree and Dill+Sour cream mash. 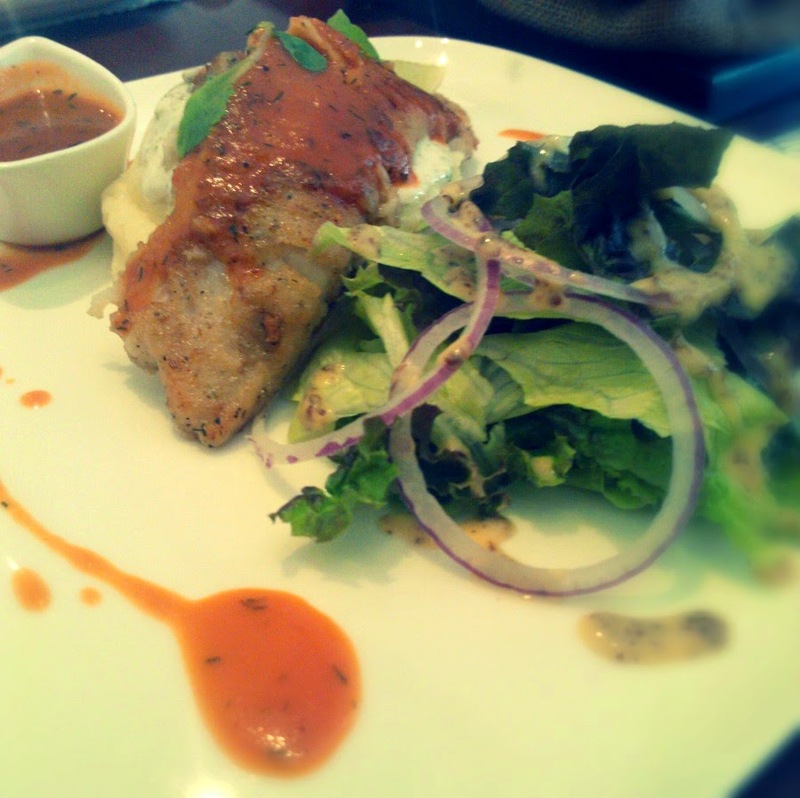 My server insisted that I should try their Cambodian Basa with Smoked Pimento Puree and a Dill+Sour cream Mash. 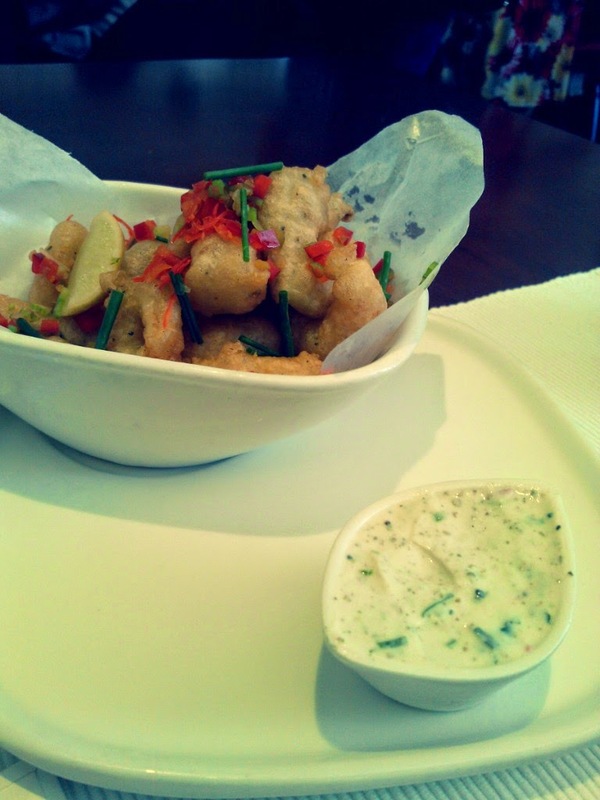 I am so glad he suggested this dish, and as much as I avoid having Basa at restaurants, I enjoyed its flaky awesomeness. But the highlight of this dish was the Smoked Pimento sauce, which was polished off to its last drop, and then fought over. The sauce is pure Gold. I did not care much about the mash. The Honey Orange Glazed Pork Chops were tender, and the Roasted Beetroot was a great combination with the meat, but pardon me, our bhookad and less sophisticated selves were busy polishing off the Cambodian Basa and did not pay great attention to this otherwise great dish. Again, I did not care for the mash. It was not very creamy and slightly lumpy. 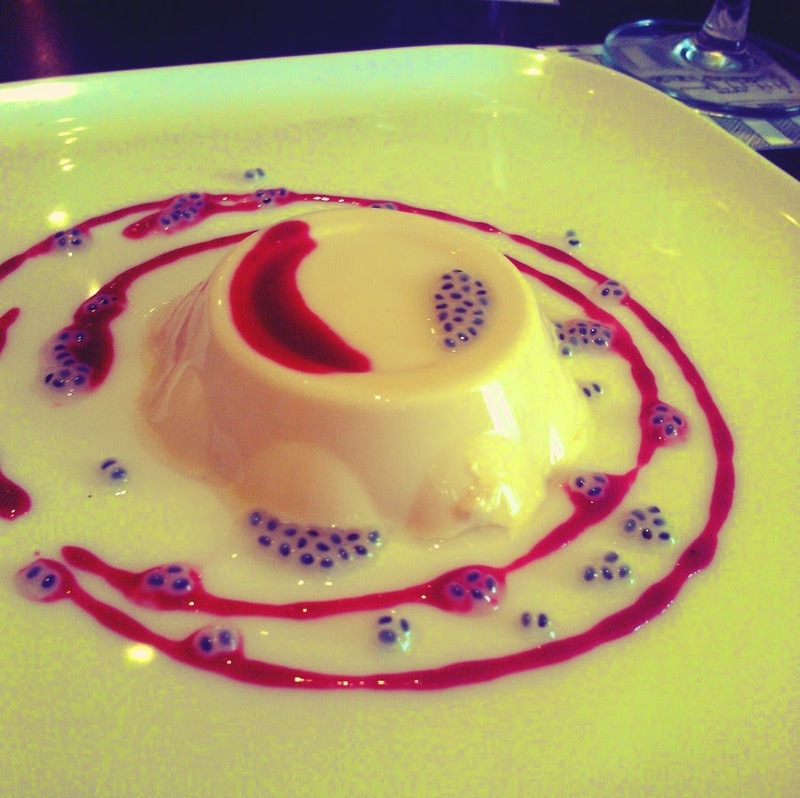 The Panna Cotta was packed with summery freshness and the Basil Seeds better known as Sabja took us back to the time when the Royal Falooda was king, and we pondered over how advanced the food scene is today, while sharing laughs about our school days of 'bhaiya, ek falooda laana, one by two'. 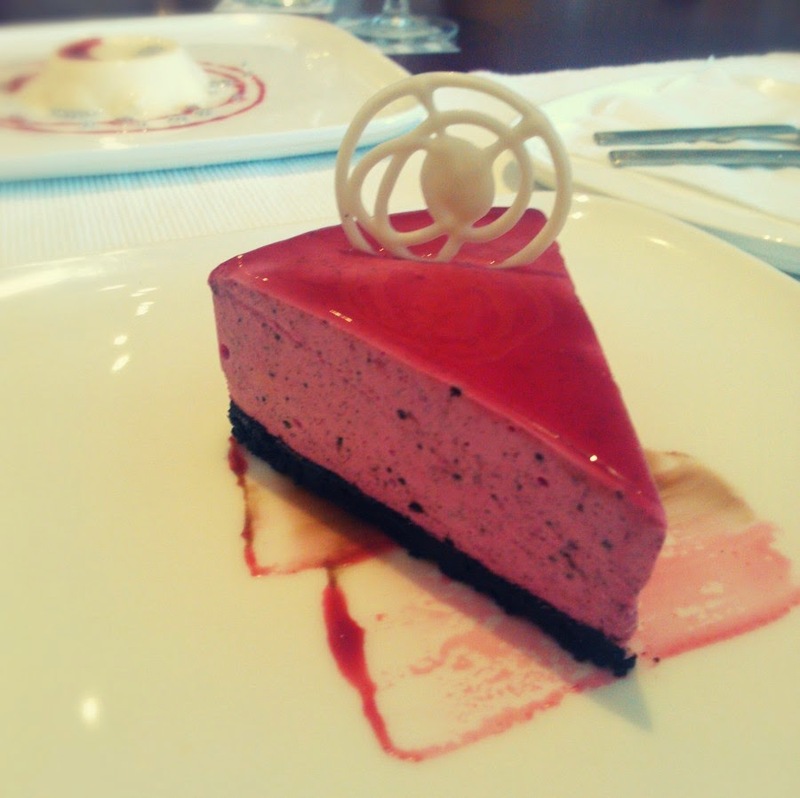 The Raspberry Oreo Cheesecake was one of the better no-bake cheesecakes I have had in Mumbai. The best part was it not being cloyingly sweet and the crust being perfectly crisp! I don't think I can summarize the awesomeness of Smoke House Deli in a single post! Looking forward to my next visit already! :) All the best and Kudos to Riyaaz Amlani and the superb team at SHD all over India!